What Is the Difference Between Newton's First Law of Motion & Newton's Second Law of Motion? How are Force And Motion Related? 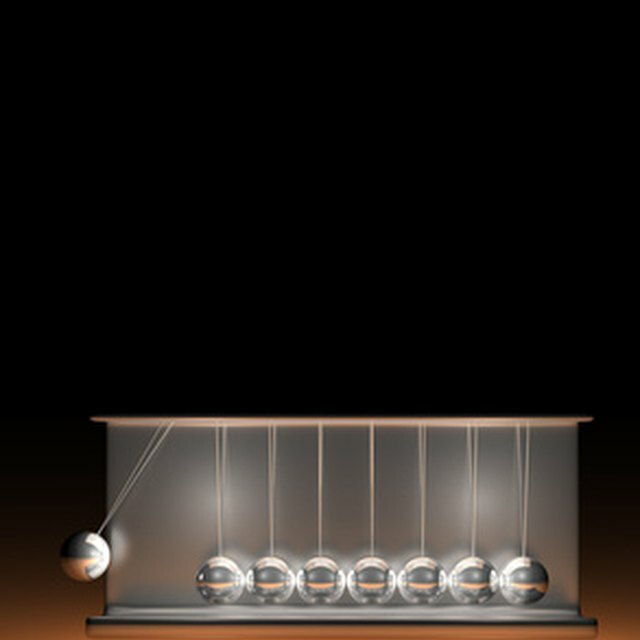 What is a Unbalanced Force? According to Newton's Laws of Motion, an unbalanced force is one that causes a change in the motion of the object to which the force is applied. An object at rest or an object in steady motion continues at rest or in unchanged motion unless it is subjected to an unbalanced force. In that case, the object accelerates in the direction of the force according to the equation: force equals mass times acceleration. An unbalanced force continues to accelerate an object until until a new counterforce builds up and a new balance of forces is established. The accelerated object then maintains a steady velocity, and the previously unbalanced force is balanced by the new force. An unbalanced force is a force that changes the position, speed or direction of the object to which it is applied. The unbalanced force accelerates the object with the acceleration directly proportional to the size of the force and inversely proportional to the mass of the object. In a steady state situation, all forces are balanced with all objects either at rest or moving in a given direction with a fixed speed. If one force starts increasing or a new force is introduced, the situation can change, depending on the strength of the increasing or the new force. If the increasing force or new force is weak, a new balance of forces is established and nothing changes. If the increasing or new force becomes too strong for the existing balance of forces, objects will accelerate, move and change their position or speed. The situation will keep changing until a new balance of forces is achieved. For example, a car rolling in neutral on a straight, flat highway is subject to several balanced and unbalanced forces. The weight of the car pushing down is exactly balanced by the force of the pavement pushing up. The car therefore does not accelerate up or down. The friction of the tires rolling on the pavement and the resistance of the air are two unbalanced forces acting to decelerate the car. The inertia of the car keeps the car rolling, but the two unbalanced forces slow it down to a stop. When the car stops, all forces are in balance again and there is no new acceleration unless the driver starts the car and drives away, adding a new unbalanced force that overcomes the previous two forces. Common forces that are often unbalanced include the force of gravity and applied forces. When these forces are unbalanced, objects accelerate, change their position and find new configurations for which all forces are again balanced. The weight of an object is the force exerted by gravity on that object. If an apple is hanging in a tree, the downward force of gravity is balanced by the upward force of the apple's stem attached to a branch. Once the apple is ripe, the stem becomes detached. At that moment the upward force becomes zero, and there is an unbalanced force of gravity downward. The apple falls. When it hits the ground, the Earth provides a new upward force equal to the force of gravity, and the situation is again balanced. Applied forces are important because they are used to move objects in accordance with specific purposes. For example, to move a dining room table to the other side of the room against a wall, one or more people apply a force by pushing it. Before the new force is applied, everything is in balance. At first the people may not push very hard, and the table doesn't move. Then people push on the table and their feet push on the floor with the force of friction. Similarly the table pushes back with an equal force due to the friction of its legs on the floor. Eventually the people push hard enough to create an unbalanced force to overcome the friction of the table, and the table accelerates to slide across the floor. When the people have pushed it against the wall, there is a new balance of forces and a new, steady-state situation. In all these cases, unbalanced forces cause a re-arrangement of objects to a new, balanced situation. Markgraf, Bert. "What is a Unbalanced Force?" Sciencing, https://sciencing.com/what-is-a-unbalanced-force-13710259.html. 14 March 2018.